Three-year-old Jacob Willis and his twin brother, Nathan, were less interested in their lunches last week and more interested in whipping their dark-blond hair around their ears and making faces across the table, their laughter adding to the cheerful din at the Women and Children’s Free Restaurant in a church basement on North Monroe Street. The boys moved to Spokane a few weeks ago with their parents and 6-month-old brother. The family sought relief from scarce job opportunities and high rent they faced in California’s Bay Area. But while they strive to do “positive things” with their children to “take the stress away from them” – trips to the park, art projects, music time – money is a particular source of worry for Willis and her husband, Chris, 27, who’s found work on the graveyard shift at a gas station to pay the bills while Willis, a former preschool teacher, cares for the kids full time at home. They’re among company. While the recession’s officially over, its protracted effects – joblessness, exhausted savings, loss of permanent housing – continue to wreak havoc on families that include children. These are the very people who can benefit from the annual Christmas Fund campaign, which aims to raise $500,000 from the community to pay for toys and grocery vouchers distributed to families in need through the Christmas Bureau. Children in the U.S. have been overrepresented among the very poor for decades. But their proportion is growing, according to children’s advocacy group First Focus, which analyzed the census figures in a September report. Of all the people living in poverty in the U.S. in 2009, 35.5 percent were children, the group said, while children account for about 25 percent of the total population. Nearly 21 percent of all children lived in poverty that year. In Spokane County, census data show, 15.3 percent of families with children younger than 18 lived below the federal poverty level in 2009 (just under $22,000 a year for a family of four). In families with children headed by single women, 42.1 percent lived in poverty. Statewide, 16.2 percent of children lived below the poverty line (compared with 14.3 percent statewide in 2008). In Kootenai County in 2009, 17.1 percent of families with children lived in poverty, compared with 18.1 percent throughout Idaho (up from 15.8 percent statewide in 2008). • Since Jan. 1, Spokane’s SNAP has served 8,786 first-time clients, said Margaret Belote, SNAP’s energy program director. Of those, nearly 32 percent were children. Nearly 15 percent were 5 or younger. In one program alone, SNAP took just eight days to fill its 6,500 available appointments for people seeking help paying their energy bills. About 1,000 of those appointments went to households the agency hadn’t assisted before, Belote said. • Catholic Charities Spokane, which administers 15 social-service programs, has seen, on average, 12 to 14 percent more clients this year than last, said Rob McCann, the organization’s executive director. Programs seeing greater demand include its St. Margaret’s Shelter for women and children, its Childbirth and Parenting Assistance program, and its immigration services and housing programs, which also serve families with children. “They’re coming from families where one or two bread earners have lost their job, where they’re on unemployment, where their unemployment is running out,” McCann said. Catholic Charities is also seeing more recent graduates who can’t find jobs and more single mothers of children whose fathers – frustrated over joblessness and unable to cope – had become abusive. “We’re seeing a lot of broken families that are broken because of the economy,” McCann said. • And the Women and Children’s Free Restaurant, where Melissa Willis dined with her twin boys, serves more than 9,000 meals to children a year. The organization changed its policy requiring children to arrive accompanied by adults, because so many hungry kids were showing up on their own, said the restaurant’s executive director, Marlene Alford. For each meal, the restaurant prepares unprocessed, homemade options – baked chicken strips, grilled cheese on whole-wheat bread – likely to appeal to children. Families with children also are making greater use of the restaurant’s adjoining fresh-market program, Alford said. 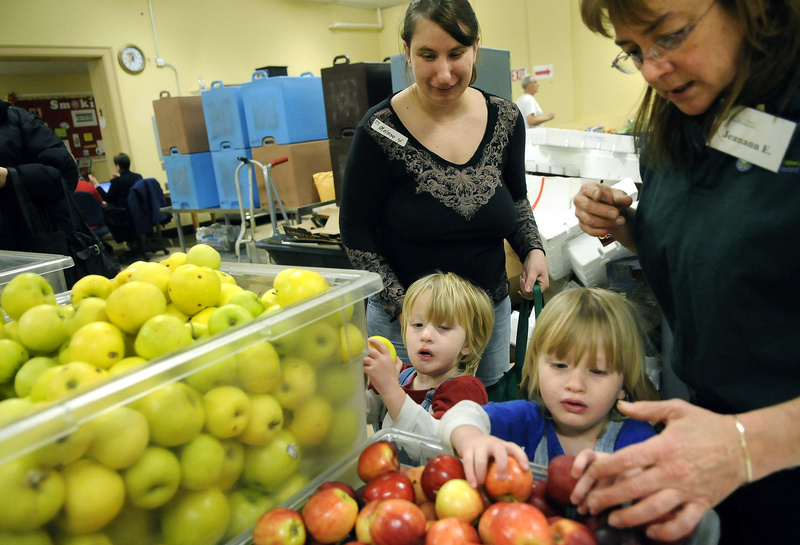 Designed to provide produce, milk, eggs and bread to get families through the weekend, now the program’s helping more of them eat through the week. For many families, the problem isn’t just joblessness, but joblessness that seems never to end. Out-of-work Americans are experiencing longer periods of unemployment than in any recent recession, according to the Brookings Institution. As of September, 42 percent of unemployed people in the U.S. had been jobless for at least 27 weeks, a statistic likely mirrored in Spokane, said Grant Forsyth, an economics professor at Eastern Washington University. And the longer your term of unemployment, the greater likelihood that you’ll slip into poverty. “When you’re unemployed for that long, you’re going to quickly exhaust your savings and whatever else you might rely on,” Forsyth said. Meanwhile, your job skills often deteriorate, compounding your job-search trouble. Compared with the aftermath of other recent recessions, the job market has been particularly ominous, according to a recent analysis by Forsyth. Thirteen months after the recession of 1990-’91 ended, employment levels were up in Kootenai and Spokane counties. Thirteen months after the recession of 2001 ended, employment levels were near level. Thirteen months after the Great Recession ended, in 2009, local employment had fallen even further. So families continue to struggle. The Willises are doing what they can to stretch their budget to keep their children warm and fed. Their rent, at $700 a month, beats the $1,200 they paid in California. But they figure the gas-station paychecks will leave them just $800 a month after paying rent. So they’ll use a wood-burning stove to heat their home through the winter. They’ll take advantage of community resources like a children’s clothing swap Melissa Willis stumbled across at another church near their home and the free restaurant and fresh market – and maybe, this year, the Christmas Bureau.